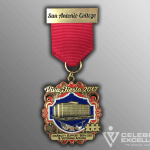 Our San Antonio College Veterans Affairs & disABILITY Support Services Department wishes to thank the Celebrate Excellence team for an extraordinary and outstanding FIESTA MEDAL! Tammany and her professional team exceeded our expectations with their talent, their expertise, their craftsmanship, their design and without question their remarkable customer service. Tammany will offer you the STAR treatment from the moment you walk in the door until the moment you pick up your finished design! It is truly a “red carpet” experience! It was amazing to walk in with an idea and a preliminary design on scratch paper and watch Tammany and her Team produce a Medal with such detail and quality! Our Medal is truly a showcase piece and a wonderful representation of our SAC Veterans Affairs & disABILITY Support Services Department. Our SAC Team was truly pleased and impressed with our magnificent FIESTA MEDALS! What is a Challenge Coin?